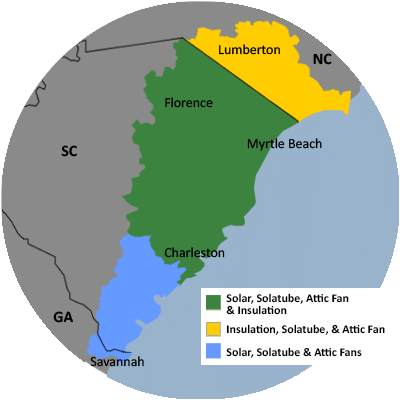 By Sam And Barb P.
For a FREE no-obligation estimate in Galivants Ferry, SC, please fill out the form to the right and Carolina Energy Conservation will contact you shortly. Looking to do 500-525 board feet inside a metal building. Wall insulation and attic.Older home want to get estimate. We specialize in a variety of services aimed to lessen your home's carbon footprint and save energy and money each month! We offer it all, from air sealing to ductwork to insulation and HVAC services in Galivants Ferry, SC. For a FREE, no-obligation services estimate in Galivants Ferry, SC, you'll also receive a free copy of "Saving Energy and Money at Home," a great book to use as you begin to create a more comfortable, healthy, and energy efficient home! The SunPower panels provide a beautiful sleek look. This customer is seeing huge savings thanks to their new solar system.